We examine how Japanese corporate governance characteristics affect IPO underpricing. 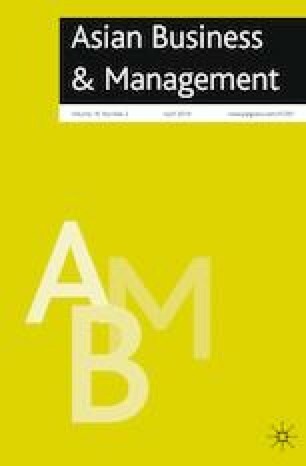 The results show that parent ownership does not affect underpricing in IPO firms. We also find that greater CEO ownership is expected to cause principal–principal conflicts and to exacerbate underpricing in IPO firms. Our empirical results also reveal that bank ties mitigate underpricing and function as effective monitoring mechanisms. Furthermore, the positive correlation between CEO ownership and IPO firm underpricing is moderated by the parent–subsidiary relationship. Finally, independent venture capital firms do not mitigate underpricing of IPO firms with parent–subsidiary relationships. We would like to thank Allan Bird, Kiyohiko Ito, Tom Roehl, Elizabeth Rose, and Yoshiro Tsutsui for their valuable comments on earlier drafts, which helped improve this article. This study is financially supported by the Grant-in-Aid for Young Scientists (A) (MEXT/JSPS KAKENHI Grant Number 17H04784), the Grant-in-Aid for Scientific Research (C) (MEXT/JSPS KAKENHI Grant Number 17K03695), and the Grant-in-Aid for Scientific Research (B) (MEXT/JSPS KAKENHI Grant Number 17KT0036). All remaining errors are solely our owns.